"This was an anniversary present for my husband. I had it delivered to his work and he was so surprised. He and His coworkers thought it was great. Only this is I wish I could have picked a date for delivery but I understand it’s not like a florist. Communication from company was very good. Telling all my friends"
"My husband thought it was really unique gift. Sometimes I run out of ideas and this was perfect! " "Love, love, LOVED IT!! I never really get my husband anything for valentines, but when I saw the ad last year and they were all sold out, I knew I had to at least try it once. The bouquet did not disappoint. It arrived ahead of schedule and I just couldn't wait to give it to him. Needless to say all his friends were jealous and I will be reordering from Manly Man for many years to come. - Thanks for the perfect gift!" "The recipient said they looked delicious but he has not tried them. It would be nice if possible, if there were more options with bundle packages. I wanted to buy my boyfriend the Jerky roses and the bacon with chocolate package but it was too expensive separately. I would have bought it if there were a deal or price decrease when you buy them together. Also, I did make a mistake with another purchase....the numerical to the house was incorrect and I tried to call UPS but they said they cannot modify the address because your company restricts it......My package is supposed to deliver this Friday and I am working with your team now to see different options...but it is only through email because there was no direct customer service contact for your company so It is making it a little harder to rectify my mistake. I placed the order on the 16th and realized it this morning on the 17th. The email personnel are very nice, but I think the back and forth takes a little long. The recipient to my 1st purchase 2 weeks ago absolutely loved the taste of the Jerky, and he loved the cup!! He liked how they looked like Flowers and it said Manly Man...haha Ive made 3 purchases and will most likely make more in the future. " "My husband loved them! I will be buying more. " "Perfect gift for my husband’s birthday! He loved them!" "Amazing experience ! Loved the jerky and so did my boyfriend ! My only feedback would be to potentially lower the next day shipments if at all possible, I would love to next day or two day ship but shipping costs more than the actual gift and was not worth it but overall great gift idea for my manly man ! " "My husband loved this! And so did my 3 year old! He kept asking me why we couldn’t eat mommy’s flowers, too! It was fun to surprise him with flowers since he is always so good about doing that for me on special days! " "It was a little pricey but it was nice. " "I bought this as a gift for my husband. I have a hard time finding good gifts for him. He tried these, rolled his eyes toward the ceiling, let out a sigh and gave them two thumbs up! " "Arrived on time and well packaged. The gift will be given next week but I am sure it will be loved. Thank you for the perfect idea for the manly man in my life." 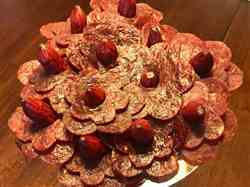 "My husband loved the beef jerky bouquet. I will be buying him this again and again. " "I sorta insisted to my husband that he send me flowers for our first anniversary (only so many hints you can drop, haha), so obviously I had to surprise him as well. This was absolutely perfect! What guy doesn’t want a special delivery of jerky?! He said that when he saw the company name /logo, he knew right away he’d like what was inside. It was a great hit at his office, & he’s been raving about the jerky. So glad to have found The Manly Man Company and will definitely be ordering more gifts in the future! " "Very happy, loved the quality. Loved the speed of delivery. Thank you! " "Loved it, will definitely order again "
"Awesome! It was fun to decide which glass to send it in. The beef jerky makes it all manly but the flowers a fun addition to the tops! " "I purchased this as a gift for a friend recovering from surgery. He absolutely loved it and the presentation was wonderful. I will be back for more! " "Overall the experience was great. The only thing I wish that was offered was specific days for things to be delivered especially for birthdays. My husband absolutely loved his gift and said it was the best idea ever. I want to thank this company very much for awesome ideas "
"My adult boys are trying to eat healthy. When I said I was sending something, they sighed and said they couldn’t eat it. When it arrived, they both called me and were so excited! Not only could they eat it, but they thought it was yummy and uniquely cool !! #MomWin"
"Hello! I ordered this for my boyfriend for our 7th year anniversary. I ordered it too soon and realized after I purchase that it would get to him too soon, so I emailed and was assured it would ship the following week. It shipped right on time as promised and arrived exactly as it should have. Great customer service and a great gift for the man in your life. Flowers he can eat! I would definitely recommend this website to others. Thanks again!" 1/2 dozen mixed jerky flowers! "This was such a cute gift for my boyfriend’s birthday! He never wants anything, or wants “something he can use”, so this was a great combination. Everything I ordered (1/2 dozen flower bouquet, some extra jerky, and Man Card bottle opener) arrived in a cute box that once openend had such a cute presentation on the inside of the box. 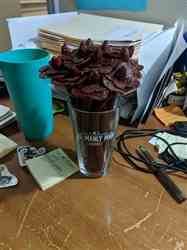 You just had to open the jerky bouquet from the packaging and place it into the beer cup. Everything had a great presentation, and I went with the 1/2 hot 1/2 other jerky and both were tasty. I prefer the hot actually! 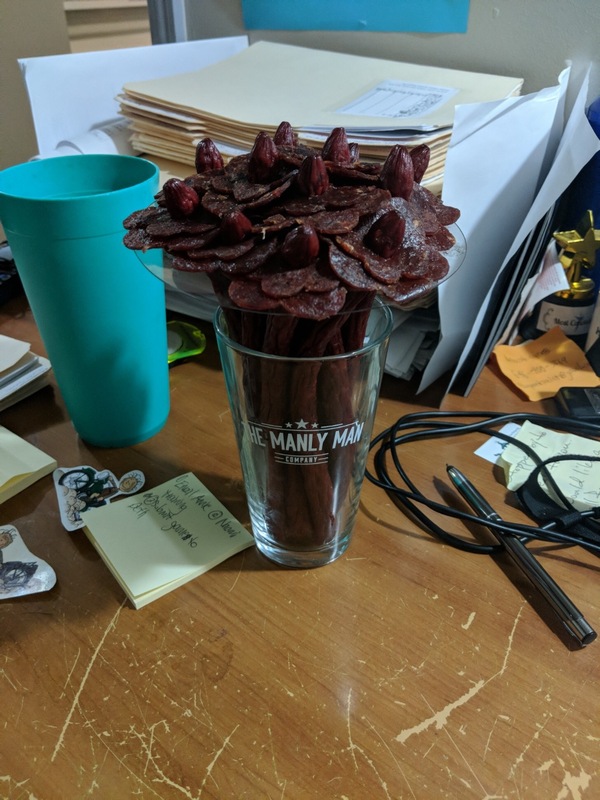 Thanks again - this was a great simple gift for a guy who wants nothing 😉"
"I sent a Manly Man Jerky bouquet to my brother-in-law for his birthday. He loves it! He is looking forward to drinking from his Manly Man pint (the vase) and he is enjoying the jerky-in his words, “deelish!” My brother in law loves jerky so if he says it’s delicious, I know that it is. I will definitely buy again. " "I bought this bouquet for our three year anniversary, and my boyfriend loved it!" "My boyfriend absolutely loved this jerky. " "My recipient thought it was cool and is rationing them so they last. My overall experience was great !" 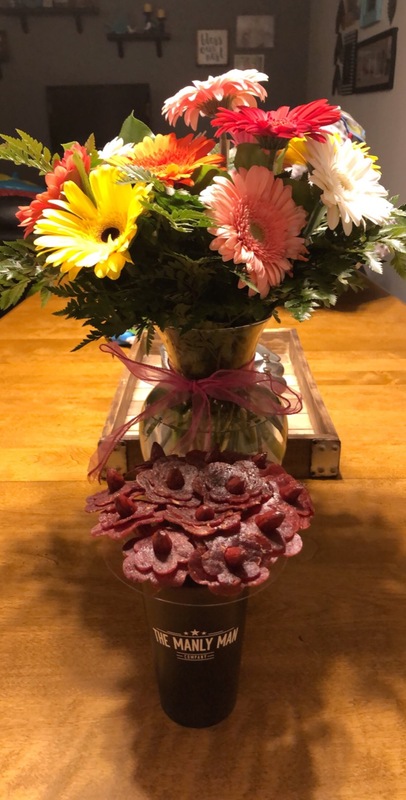 "I purchased a jerky bouquet for a friend. The only thing I would change is shipping options. I would have been nice for him to receive it a bit sooner. " "The entire ordering process was very user-friendly and my friend loved his gift!" "Decided to order this and send it to my boyfriend! He thought it was a pretty nice and unique idea! "